Since it was founded in 1976, Apple has become one of the most successful technology companies of all time. Central to the company’s ethos and success has been the philosophy of purchasing smaller companies to integrate into their product line – but was it a successful strategy? 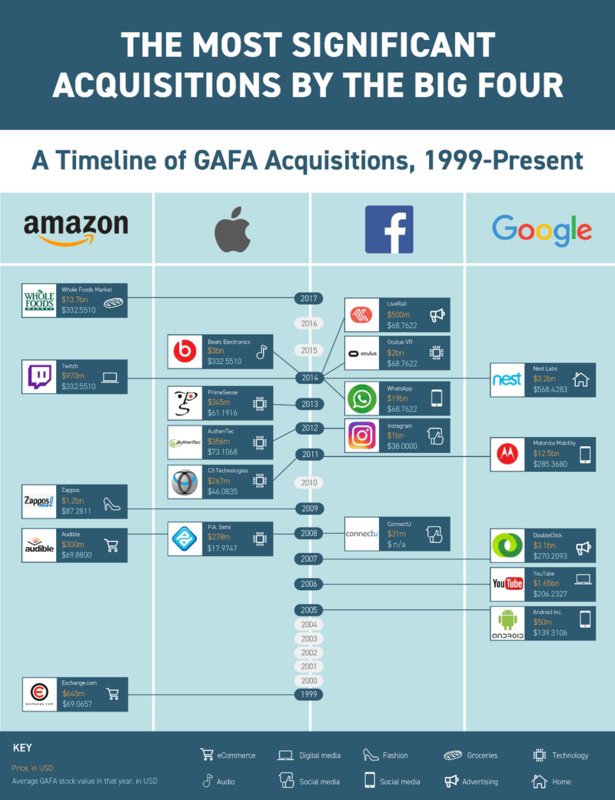 In this post, we’ll look at Apple’s acquisition history and how these acquisitions have affected their stock price. As of March 2019, Apple has acquired 107 companies, according to Crunchbase. With net sales now reaching over $265 billion and a share price of over $187, there appears to be little doubt that this acquisition strategy has been successful. However, as well as helping Apple’s board by increasing its share price to highs of over $225 per share in 2018, these acquisitions have had far-reaching impacts on other financial markets. For example, the price volatility caused by these frequent acquisitions has also created opportunities for traders with a CFD trading account. This is because traders have been able to speculate on whether Apple’s shares are going to rise or fall in price following these acquisitions without needing to physically own shares in the company. In March 2018, Apple announced that it had acquired Texture (formerly known as Next Issue), a digital magazine subscription service known as ‘The Netflix of magazine plans’. Launched in 2010, Texture’s multi-title subscription service allows users to access their favorite magazines on the go, giving readers access to around 200 magazines for a monthly subscription fee of $9.99. The value of the deal was undisclosed, but it followed Apple’s trend of major acquisitions that included Pop Up Archive (2017) and Gliimpse (2016). The deal was also announced only three months after Apple revealed that it planned to acquire Shazam, the music recognition app, for $400 million. How Have Acquisitions Impacted Apple's Share Price? In light of these recent acquisitions, Apple’s earnings and revenue continue to head higher, with the company focusing on the excitement generated by future products and digital services. Married to this, in Q4 of 2018, Apple also relaunched its product range, updating its Macs and iPads, with some analysts predicting that sales would top $100 billion in a quarter for the first time ever. As a result, analysts are currently buoyant over Apple’s stock. This is partially thanks to its acquisitions and partially thanks to its new, revamped products. Apple’s revenue in the three months to the end of September (the end of the financial year) rose 20% year-on-year, meaning growth was well ahead of predictions and market analysts. Looking to the future, Apple’s acquisition-based strategy shows no signs of slowing down. Although some of Apple’s success is undoubtedly derived from its ability to stay at the cutting-edge of the consumer technology sector, its aggressive acquisition strategy also plays a role. Looking at 2019 specifically, it’s likely that Apple will endeavor to buy more companies in order to strengthen its brand and product offering, with the company specifically looking to increase its interest in data, analytics and AI.